The Deepwater Horizon oil spill impacted the Western Atlantic bluefin tuna’s spawning habitat, including the shelf and slope waters of the northern Gulf of Mexico, a new study confirms. The spill occurred in the warm spring months during the peak spawning time for the Western Atlantic population. 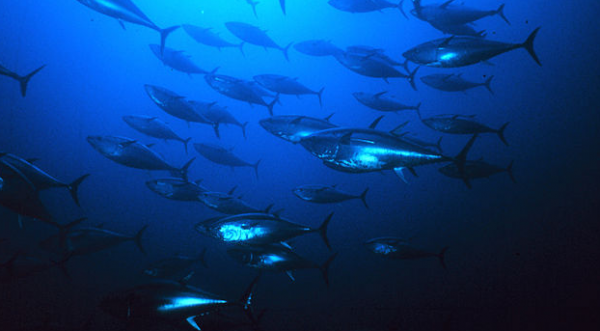 By electronically tagging bluefin tuna in their Northwest Atlantic feeding grounds with instruments that remained on the fish as they moved in and out of the Gulf of Mexico to spawn, the team captured the locations of the spawning habitat from the tag data using complex behavioral algorithms. The new report from Nature’s open access journal Scientific Reports used 16 years’ of electronic tagging data from 66 Atlantic bluefin tuna to directly map preferred spawning habitat in the Gulf of Mexico and assessed how much preferred spawning habitat was affected by the Deepwater Horizon spill. At its peak in June of 2010, the Deepwater Horizon oil spill covered more than 5 percent of the spawning habitat of Atlantic bluefin tuna in the U.S. Exclusive Economic Zone. Although the spill encompassed a relatively small proportion of the bluefin tuna spawning grounds, which extend throughout areas of the northern Gulf of Mexico, the authors showed the cumulative oiled tuna habitat was 8,086,120 Km2 representing the potential for a significant impact on eggs and larval bluefin tuna The authors concluded that the spill impacts could make it more difficult for the population to rebuild, particularly in combination with the multiple stressors of ocean warming and fishing pressure. “We know that bluefin faces numerous threats in the Gulf of Mexico and the oil spill represents another potential impact during a critical portion of their life history,” said Elliott Hazen of NOAA Fisheries’ Southwest Fisheries Science Center in La Jolla, Calif., and lead author of the study. Coauthors of the research include Aaron B. Carlisle, James Ganong, Rob Schallert, Steve Wilson and Barbara A. Block of Stanford University; Michael J.W. Stokesbury of Acadia University; and Steven J. Bograd of NOAA Fisheries’ Southwest Fisheries Science Center. “It took us many years to establish and perfect the techniques of putting a satellite tag, essentially a small computer, on giant bluefin tuna, many over 1000 pounds in this study, and figure out exactly where and when they potentially spawn in the Gulf of Mexico” said Barbara A. Block of Stanford University who led tagging efforts. Exposure to oil has previously been shown to have physiological consequences to the heart and can cause deformations and death in eggs larval fish so effects on the spawning habitat are especially important in assessing the impacts of oil spills. The effect of oil on spawning adult fish is not as well understood, but oil may stress all life history stages occurring in the Gulf of Mexico. The researchers said that their results predict that the Deepwater Horizon spill may have harmed some of the 2010 year class of bluefin tuna, but further monitoring is needed to understand how that affects the population at large. Link to the new publication . . .